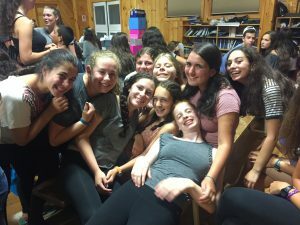 This week has been a crazy week for the chanichim (campers)! O n Tuesday night, the chanichim watched the really awesome camp play “You’re a Good Man, Charlie Brown.” Many of our Ma’alot chanichim had a role in making this production happen, including painting the set. Afterwards, they prepared for rikudiah (dance festival), which was the following night! On Wednesday during the day, a bunch of our chanichim participated in life guarding practicals, in which they had to perform as a lifeguards in real-life scenarios given by the waterfront staff. Other chanichim began painting the fence between the boys’ and girls’ area which is Ma’alot’s chesed (acts of loving kindness) project this month. That night, we had Rikudiah. All the chanichim dressed in pajamas and performed an awesome dance together! 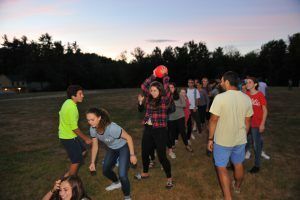 The last dance of the night, though, was put on by the roshei ayda (heads of unit), in which an “argument” broke out, which eventually lead to the break out of Maccabiah (color war)! After quick team meetings, the chanichim went to bed, excited for the next day, which was achla yom (trip day)! Yesterday morning, the chanichim all had a late wake up and met up with their Gurim buddi es at Weirs Beach in northern New Hampshire! After having an awesome time in the water and eating lunch, the buddies separated into groups, taking turns making sandcastles and eating delicious Gifford’s ice cream. The campers then came back to camp to amazing deli sandwiches and the first game of Maccabia titled “Le’mala-Le’mata” (over-under). We have reached the final stretch of camp and are super excited for the upcoming Maccabia games!